Joseph R. Bowles House. From tagwh.at. Image by Historic Preservation League of Oregon/Stuart. Classified as Italian Renaissance, this home be designed by Albert E. Doyle and built in 1924. The Bowles house is a 4,959 sq. ft. two-story reinforced concrete building with Spanish tile roof and Italian marble columns. The architect, A.E. Doyle, was sent to Italy at least once by the builder to study Italian architecture. Although not direct copy,, the house was inspired by Sorento Renaissance villas. The house and grounds have only two changes imposed: the 4.5 foot deep reflecting pool in the atrium was covered over in 1964; and the original gas-fired hot water heating system has been converted to oil. 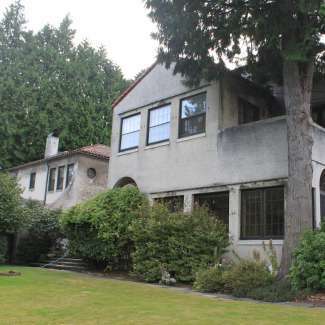 Ehe house is an outstanding example of 1920s craftsmanship wherein expense was no barrier. The house cost approximately $750,000; the grounds and landscaping an additional $168,000. and teak parquet; the undermost of marble. Mr. Bowles was unusually concerned about his fine wooden floors and he wanted to protect them. Black walnut, oak, maple and teak are used throughout in the woodwork, stairs and doors. All of the interior walls are surfaced with either paneling or fabric. A scented silk brocade covers some of the closet and dressing room walls. The rest of the wall surfaces are covered with painted canvas, with some notable exceptions. The two-level entry hall has gold leaf over the canvas; the breakfast room has silver leaf; the dining room has antiqued gold leaf. Originally, there was an organ in the living room, but Mrs. Bowles donated it to an Oregon church prior to moving out of the house in 1953. The original painted maple organ screen remains in the living room; the cork-lined echo chamber is extant in the basement. A number of unusual spaces occur in the house, There is a 6x6.5' silver vault on the main floor; a temperature-controlled fur vault on the second floor. The study bookcases pivot to reveal a hidden bar complete with marble sink. A hidden closet and small jewelery receptacles, opened by hidden catches, appear in the master suite. In the interior only one item has been removed--the sink counter in the kitchen. All of the other cupboards, marble topped counters, dish warmer and refrigerators are extant. The house is unusual in retaining all of its original fixtures. The chandeliers, wall sconces, brass hardware, bell pulls, bathroom fixtures arjd accessories (towel racks, robe hooks, etc.) are original. All of the bathroom faucets and spigots in the family side of the house are of sterling silver. 42 steel ships, among them several 880-ton cargo ships, 12,000-ton oil carriers, and ships which figured in the United States' World War I efforts. The firm had one of the largest shipbuilding complexes in the country and could build two ships a month. In May, 1918, the firm built three. Early in the War, Mr. Bowles recognized that the German shipbuilders were reputed to be the most efficient in the world. He purchased German shipbuilding manuals, taught himself German, and copied their methods in his "Liberty Ships." The Bowles residence was built in 1922-24. It remained under Bowles family ownership until Bowles' widow sold the house in 1953. The house is located on Vista Avenue in Portland Heights, one of Portland's finest residential areas, in which nearly all the properties are single-family homes. The Heights did not begin to develop until the 1880s, when the streetcar made home sites accessible. The subject property encompasses 9/10 of an acre. In addition to the house and its two porte cocheres, a four-car garage and two greenhouses appear on the site. The exterior marble terraces are of marble salvaged from the Vanderbilt house on Madison Avenue in New York. The garden stepping stones are paving stones originally used on New York's Wall Street. The original underground sprinkling system remains.